We just brought our ’04 25’ Safari home behind our 2010 4x4 Expedition. The Expedition has a 6-spd transmission, but has a “tow” mode selector to limit the top gear(s). The set up is an excellent match for power/weight. 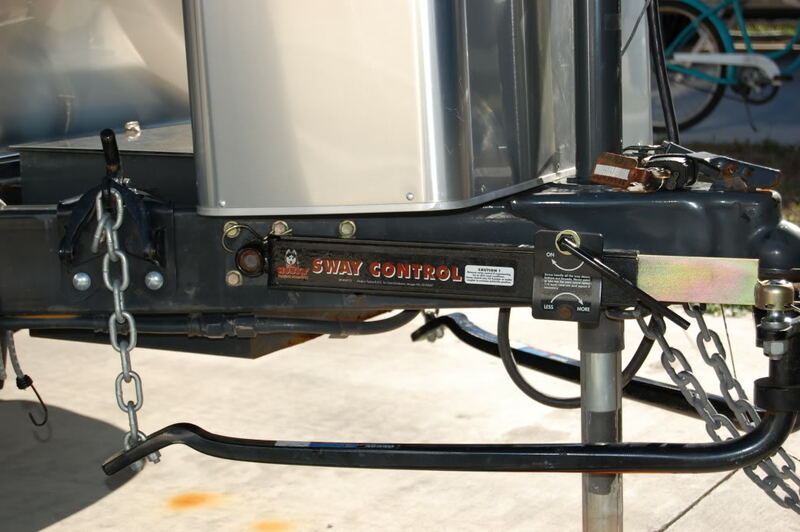 The WD hitch the trailer came with is a Reese/Draw Tite and it has also the matching anti-sway link. I set up both the TV and the TT to be level. However, I noticed that at speeds below 40 mph there was some noticeable chatter (read: very slight jerking). Above 40-70 mph everything rode smoothly as glass. It was easy to forget that the trailer was there. Anything in the anti-sway (friction-type) link adjustment that could be causing this? Any educated guesses? I used the same set-up on both our old Safari and the Classic when we first got it. Never experienced the concern you are describing. Only happens when towing..straight line? Doubt it could be caused by the friction bar, I would check for excess runout on wheels/tires both on the TV and trailer. Set tire pressures. Also inspect the trailer brakes for dragging and a possible brake drum out of round condition. Jack trlr and spin each wheel. Only shows on straigh line towing at lower speeds. The TV is brand new, only 1500 miles, and the TT did not cause any vibration with the previous owner, I know that. All tire pressures are to spec. My only suspect is what's in between the TV and TT. I kept the TV at the same attitude (dimentions to wheel well lips) as when not towing. Perhaps this vehicle needs a bit more tongue weight? I will take the rig to the scales to see what's going on, however. Make sure the 2 5/16 ball is tight a loose ball can give you this symptom. What kind of hitch pin are you using? A bent end one? A strait one? Bent ones are hotorious for being a little to small. My trailer will have very slight jerking. I have round out the hitch hole some with all the towing. Hi, at this speed I would look for an out of round tire on your trailer. [tread separation] what is the DOT code on these tires, they could be oringinal? I've had problems w/ hyper-active cruise controls - does this happen w/o the cruise control engaged? If you have disc brakes, make sure the brake actuator is compatible w/ your vehicle's brake controller. Only shows on straight line towing at lower speeds..... My only suspect is what's in between the TV and TT. That friction bar looks new...did the PO also use it? Find a long, straight, smooth stretch of hi-way and take it off..see if the jerks go away. RC: yes, the sway bar was used by the previous owner. On the way home I was passed by semis and I had no sway or even much of a hint of being passed by the 53-footers going at 70+ mph. I'm suspecting my new brake controller is not 100% in tune with the trailer. We'll see. POI...speaking from experience...watch out when making sharp turns. The friction bar can retract/extend all the way, bind up and bend the ball mounts...ask me how I know. I had to move mine back on our 63,(bar extended halfway when straight ahead) it's hard to tell, but in your pic the bar looks to be a little less than half extended. Could be the TV is not straight. If you can find a fairly long straight hill, 1 or 2 % grade like on an Interstate, go up that hill at the effected speed. If the problem still shows itself while on the hill it is most likely in the tires or a pulsing of the trailer brakes. Pulling the hill will cause constant tension on the hitch system thus eliminating any chance of mechanical reaction in the hitch. Expansion seams in poured concrete highways can have a harmonic based on speed and the length between your tow vehicle & the trailer axles. You can rule that out by experiencing the same jerking on a good condition asphalt highway. This seam effect can get quite annoying as a concrete roadbed ages. Your term "slight" makes me wonder if this is the problem at all. Michelle? Bent hitch pin? Intentionally bent or due to effects of age & wear? Frank, it is common that the hitch bar fitted into your Expy's receiver has an adjustment to allow about a 15 degree tilt toward the trailer. That is an angle specified by ... morning moment here ... hitch mfgrs? antisway mfgrs? I can attest to this effect. The 407 Highway (toll road, actually) near us is mostly concrete, and adds the jerking effect to the drive. It makes me think of riding a horse, actually. In the over 6,500 kilometres (~4,000 miles) that we put on in November, that highway was the only one to display this rather disconcerting motion. Got a stretch here on the 90 just east of the West Seneca toll station, about 4miles long, only way to make it bearable when towing... -40mph. or less.